Let's discuss, how not to live on a boat. All you have to do, is overcomplicate a simple process... Or expose yourself or your partner, to a situation that becomes scary or seems to technical to either of you or both of you. A prime example, would be to go on a boat as crew in a sailboat race... Or have you practicing tacking into six-foot seas in a 20 foot sailboat with a center board. 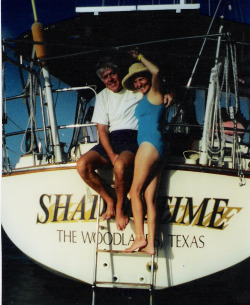 To really, really ensure that your dream of sailboat cruising will never happen, try an accidental jibe that puts you or your spouse in the drink. That would probably do it...wreck your dream that is...probably expressed with colorful language. Remember sailboat cruising and sailboat racing are two different animals... One is fun and stressless... The other stressful and competitive. In our eight years on the water, I can only remember participating in one race amongst the cruisers. I was a crew member on a boat that occupied the same spot in the ocean along with two other boats. The so-called "fun race" made for some bad feelings, and sailboat cruising is all about having fun... I would leave sailboat racing to the young and the competitive, who strive to be on the next America's Cup winner. I have been by several sailing schools and notice the blackboards showing points of sail, a tacking diagram, or a list of 10 nautical knots that you must learn how to tie. This ranks right up there with sailboat racing as a good way to turn off a reluctant spouse in even considering sailboat cruising. Is it nice to have a bunch of sailing knowledge, sure, but it is certainly not necessary to enjoy sailboat cruising... how not to live on a boat overcomplicate things. 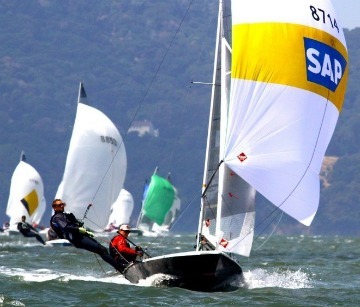 Sailing schools also usually employ small, 20 feet or less, boats that have room for a maximum of three people. A sailboat chosen for sailboat cruising, will be much bigger, more comfortable, and handled differently than these boats used in the sailing schools. Ask yourself the question... Will I be cruising on a 20 foot boat with an 18 inch freeboard (that's the distance from the rail to the water)?...like the boat pictured above... The answer is easy... No way. Our boat had a freeboard, of around 5 feet. Us on the stern, high and dry. Once in the Caribbean I can't remember ever getting splashed with water while on passage... So set your objective is to cruise the have fun which would include staying dry, I would pass on sailing school. The only exception I would make to that, would be if you did the school to increase your general knowledge about sailing... But sailing and sailboat cruising are two different things. 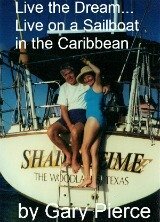 If you have a dream of someday living on a sailboat in the Caribbean, like we did for eight wonderful years, there's a right way and a wrong way to go about it. Especially if your spouse is not as enthusiastic about this lifestyle as you are if you do the above you stand a good chance of wrecking your dream of living on a sailboat. Remember the person that subscribes to the KISS (keep it simple stupid) axiom has a future as a sailboat cruiser... He who overcomplicate things, and tries to learn skills that do not apply to sailboat cruising will easily learn how not to live on a boat.